Your wedding day is the most special occasion of your life. It is the day when your dreams come true and when the age old “boy-meets-girl” story becomes a reality. Here at A Happily Ever After Floral, LLC in Jacksonville, Fl. let us help you embark on your journey and elevate your occasion with the beauty of flowers. 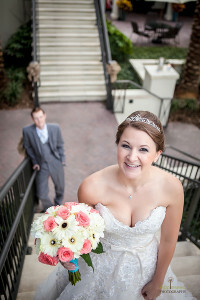 We love designing custom floral bridal bouquets for your wedding. It is our mission to provide you with personal service beyond compare and a hassle-free experience so you can focus on your day, not on the details; leave that to us. I realize how important it is to you that everything is just right on your wedding day, and I want to provide you with the attention that you deserve. Here at A Happily Ever After Floral LLC, we do not do any retail or day to day flowers, so we can concentrate exclusively on you and your event. We are only a wedding florist. We would like to invite you to make us a part of your special day, whatever occasion that may be. Let us transform your world with the beauty, eloquence, and sophistication of flowers. As your Jacksonville and surrounding area wedding florist, we specialize in wedding flowers, bridal bouquets and centerpieces. Let us personalize your vision for your wedding and allow us to add those special touches that make it one to be remembered. Please feel free to schedule a consultation via phone, email, Facebook, Google, or in person. I hope to hear from you soon. Check out our photo gallery to see what we’ve done for our couples! Check out our reviews and see what others have said about us. Visit A Happily Ever After Floral's profile on Pinterest.